Where did Feburary go? The last few weeks have been so busy and then this snow. Hubby was in the hosptial for 10 days then back to rehab and now finally this past Saturday I brought him home. Was looking for a picture to show which wasn't all that snow outside but this is what I have hanging in the window in the basement porch. The pot of geraniums which I have hanging outside in the summer. brought them in for the winter and never before have had them bloom like this. I also found out they had a new type editor for blogger so changed to it and now maybe I can put a picture where I want it. Neat. This is one of the projects I completed this past couple weeks. Using some charms I saw this setting which was from Kansas Troubles and it worked out perfect for the Island or in the middle of my table. These are Thimbleberries which is what I use most of the time. I am also working on the TB club blocks. Have the first 3 months done. I am in a online club and she sends 3 months at a time to save money for both of us. I think I am really going to like this one. Then I'm also working on another Schnibble's like the blue and yellow one . This one is using a Moda plate I had bought, the Collection for a cause. Will show a picture when I get it completed. 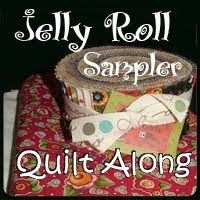 Kim has talked me into doing the Jelly Roll Sampler Sew in which is an ongoing block, 2 a month. So have ordered a jelly roll from Fat Quarter Shoppe of Kansas Troubles. I have background fabric in that to use. 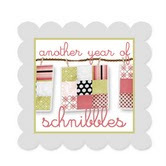 I have the first pattern printed out so can get busy on that as soon as the Jelly roll arrives. Also have to learn how to grab the button and where to put it. Help, Kim. Just another view of my house after the last one and this is my neighbor Rusty's tractor. He really did a great job. Just see the mailbox and paper box. A good 2 feet on the roof. Now hopefully Spring will be right around the corner. So far things have been OK with Hubby being home. We had to go out today to get his pacemaker checked. He is still on the thinking of the nursing home. Wanted me to get him dressed in bed this morning like they always did there. He has to learn he is now at home. Should be getting an aide coming to give him a bath. Just something I don't care to do. It was funny though last night after I was asleep about an hour he called. He was all wet with Mountain Dew. Had gone to sleep with a small bottle opened in his hand. Well of course it tipped and the whole bed and him had to be changed. At least I got to sleep until 6 when he woke me with his TV. Such is life. Not free to sit and sew or quilt any more. But at least he is doing much better. Sorry I have been so long. Maybe I will do better now that I know about this new editor. Thanks for stopping by.